In an effort to nourish both the academic and spiritual needs of our students, Our Lady's School has sought the guidance of the Jesuit Order through the support of Our Lady of Guadalupe parish. We strive to evoke St. Ignatius of Loyola's standards of education by promoting justice, love, service and spirituality in all that we teach and do. The Characteristics of Jesuit Education was published in 1987 as the charter for Jesuit schools. Composed by an international commission, which met over four years and consulted worldwide, it is based on the life and writings of the Jesuit founder St Ignatius Loyola (1491-1556), on the history of Jesuit education since the first school was founded at Messina, in Sicily, in 1548, and on best contemporary practice. What follows, including the headings, is the summary of The Characteristics of Jesuit Education by Bruce Bradley S.J. from the website www.colaisteiognaid.gaillimh.edu.ie. The world is charged with the grandeur of God' (G.M. Hopkins SJ). God is at the heart of his creation, which shares in his mystery, and God is at work in human history. Jesuit education therefore facilitates the discovery of and encounter with God in the world around us. We are called to find "God in all things." Jesuit education sees the human person, understood in the context of God's eternal plan. Through the curriculum, co-curricular activities and the environment of the school, our mission is to help each child grow holistically and lay the foundations for life-long growth. We are defined as persons above all by our values, by the habitual moral choices we make. Jesuit education is essentially value-oriented. Jesuit pupils are to be people of conscience, able and willing to stand up and be counted in the name of the truth, prepared to use their skills of self-expression and advocacy for those who may have no voice, and committed to choosing the path that is right, not the one that is merely popular or fashionable. For Jesuit education, Jesus Christ is the human face of God and the model of all human life, responding totally to the Father's love. His way of compassionate love and service is not a way but the way. A Jesuit education promotes the spiritual growth of the individual through the development of a personal relationship with Jesus Christ. It is also reflected in the practice of communal prayer and worship and the celebration of the sacraments as components of school life. Jesuit education is intended as a preparation for a life of active social commitment. Jesuit students are encouraged to understand their own "place" in the world, in terms of educational and socio-economic opportunities, and to use these opportunities in compassionate service of others, especially those whose opportunities have been less than theirs or who are the victims of poverty and injustice. We aim to facilitate the emergence of young women and men who will exercise leadership in terms of these values and seek to be agents of change, not more or less passive upholders of the status quo. St. Ignatius founded the Society of Jesus – and Jesuit schools – as part of the Church's mission, to which he was intensely loyal. This mission is to spread the Gospel of Jesus Christ and, in this way, to build the Kingdom by serving and humanizing the world and giving glory to God. The commitment to excellence – in terms of intellectual rigor and all aspects of school life- is at the heart of Jesuit educational philosophy. The Jesuit motto is ad maiorem Dei gloriam (God's greater glory) – St. Ignatius was always seeking "the magis" ("the more"). Jesuit schools today promote excellence and best practice and seek to uphold the highest standards and most authentic values in education. 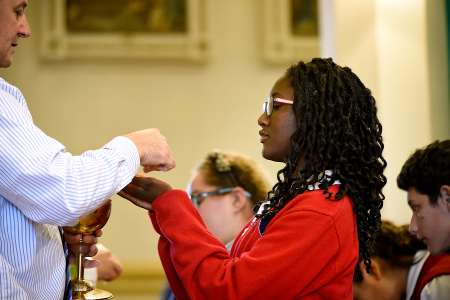 Jesuit schools are intended to be communities of life, work and worship. Staff, Jesuit and lay, collaborate in service of shared values, a common task and an overarching vision, as reflected in the characteristics of a Jesuit Education. Pupils are encouraged to respect and care for one another as companions in the spirit of the Gospel. The community of the Jesuit school embraces not only all those within it – pupils, teachers and members of the wider staff – but also, very particularly, parents, along with board-members, past pupils, and others associated in any way with its operation. During the course of his conversion, St. Ignatius learned discernment, the capacity to reflect prayerfully on his experience at the most profound level and learn from it. The habit of reflection is part of the Jesuit approach to education, as to everything else. In the same spirit of constant self-improvement, each school is called to adapt and develop in the light of our shared wisdom and the local circumstances in which each one operates, and members of staff are encouraged to avail of opportunities for their own continuing formation.